Auteur : Karlip Joshua M.
"An outstanding work. Skillfully navigating between biography and wider historical analysis, Karlip's book stands out for its texture, passion, and range. The Tragedy of a Generation will take its place as a masterpiece of Eastern European Jewish history." "The Tragedy of a Generation is an exceptionnally important book. 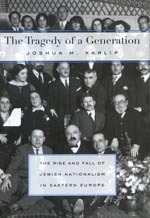 Karlip marvelously and convincingly describes the crisis of a group of Eastern European Jewish intellectuals who could no longer embrace modernity nor return to faith."